In this next series of posts, we will look at some utility firearms that were usually not used to take human life. The first one we will look at is the Flare Gun, otherwise known as the Very Pistol. The name "Very Pistol" is derived from the name of the inventor, Lieutenant Edward W. Very, of the United States Navy. 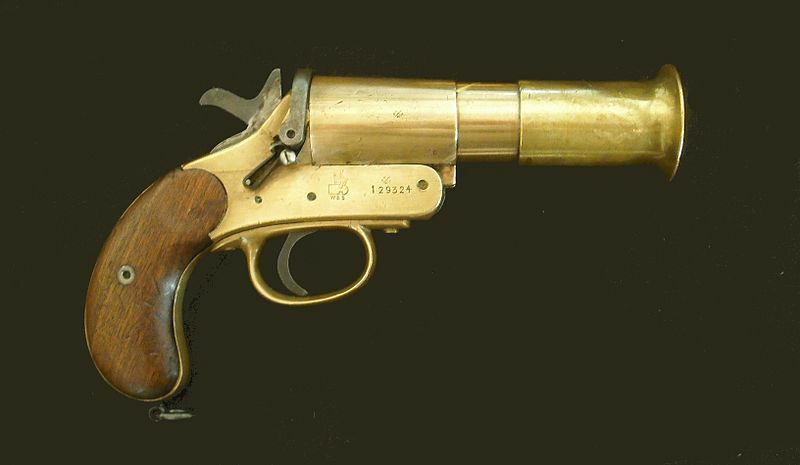 He invented a large caliber single-shot pistol with a single action firing mechanism, that could fire special flares into the air. It was designed to be used by people to send signals and reveal their position, usually to indicate that they were in distress and needed assistance. Flare guns were heavily used in both world wars and are still in use today. The flare guns of World War II era had a 1-inch bore (25.4 mm) and modern ones are smaller (12 gauge (18.53 mm.) diameter) Modern versions are usually made of brightly colored plastic, so that they're easy to find in an emergency situation. Image licensed by user Andy Dingley @ wikipedia.org under the Creative Commons Attribution-Share Alike 3.0 Unported License. 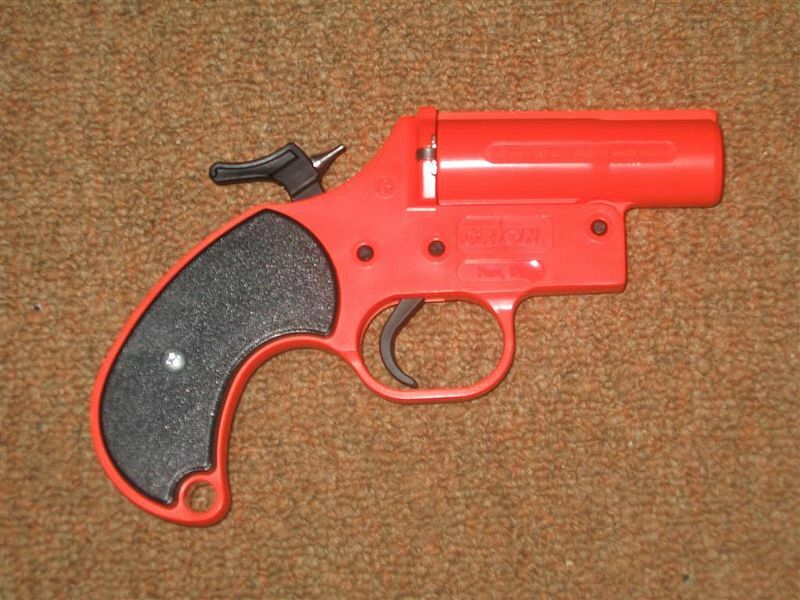 Modern 12 gauge flare gun manufactured by Orion Electronics. Note the bright plastics on this model. Click on image to enlarge. Image licensed by P. Ubriaco (c) 2004, under the Creative Commons Attribution 2.5 License. The flares come in three colors, red, green and "white star", and have a burn time of anywhere between 5 to 10 seconds, depending on flare type. Distress flares are typically shot straight up in the air, for maximum visibility time of the flare and also to show where the person in trouble is. During World War I and II, flare guns were also used in situations where radio silence was important. By firing sequences of pre-arranged colored flares, aircraft and ground forces could identify each other's positions and send specific signals. 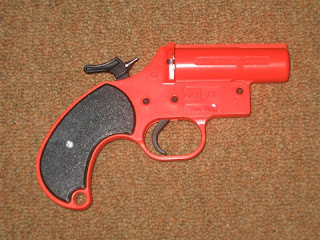 Flare guns aren't made as strongly as normal firearms, so it is extremely unwise to try shooting a normal 12-gauge shotgun cartridge out of a flare gun, as the flare gun is likely to explode in the user's hands. While flare guns are not designed to be a weapon, there have been instances where they've been used in that role. In World War II, a German pilot, Oberleutnant Arnim Faber, accidentally landed in an airfield in Wales and was captured by the duty pilot, Sgt. Jeffries, who didn't have a normal firearm and hence grabbed the nearest thing available, which was a Very pistol. When the USS Borie was hunting for the German submarine, U-405, they rammed into each other and hand-to-hand fighting ensued, where at least one of the crew of the U-405 was hit in the chest by a Very flare fired by the crew of the USS Borie. The most famous use of a flare gun is immortalized in the song, Smoke on the Water, by the British hard rock band, Deep Purple. Many people, even those that never listen to hard-rock or heavy metal music, will instantly recognize the opening guitar riff of this song, even if they don't know the title of the song. The story behind the song is this: the members of Deep Purple were in Montreux, Switzerland, trying to record a new album at an entertainment complex that was part of the Montreux casino. Meanwhile, Frank Zappa and the Mothers of Invention were playing a concert inside the casino theater, as part of the Montreux jazz festival. During the concert, a member of the audience fired a flare gun inside the venue. The ceiling caught fire, but the audience initially thought it was part of the show. The resulting fire ended up burning the entire casino down. The members of Deep Purple were watching the blaze from across the lake and were inspired into writing a classic song that has since been covered by countless hard-rock and heavy metal bands. The lyrics of the song make references to the flare gun.